We at Arizona Premium Mattress Company are proud to be one of if not THE first latex mattress manufacturers to bring this incredible product to the states and offer it at our normal factory direct discounted prices. 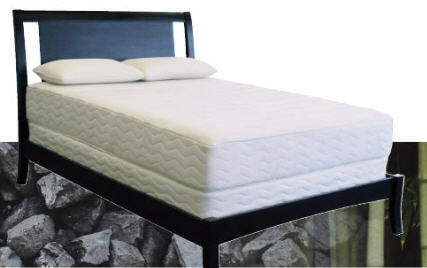 Of course this product will command an extremely high dollar when it finally hits the retail mattress stores but you now have the opportunity to own a modern marvel at a fair and honest price. Construction is simple: One 6" Full Size (53 x 74) Dunlop Processed Latex Core made with Certified Organic latex, available in soft, medium or firm along with a 2" soft full size topper of the same material. Finished off with our organic cotton zippered cover which is the same one we use on our Natural Talalay Latex model. This item is roll packed as one piece and ships via UPS door to door nationwide including Canada.